Welcome to Steel on Steel! Here are a few tips to help get you started. Take a few minutes to look around and familiarize yourself with our site in order to get the most out of your membership! We have plenty of resources, and you can always contact us if you need help or check out our Help Page here. In the upper right-hand side of the home screen on our site, is the My Account menu. From there, you can view and edit your membership preferences, modify your subscription, upgrade, downgrade, change your password, track your payments and add or edit your credit card and contact info. *See our automatic billing policy at the bottom of this page. Free 1 Month Trial – Listen to an entire month of future episodes and an entire month of archives, no credit card necessary. Basic – $10 per month, or $100 per year. Listen to the weekly program and an entire year of archived shows. Premium – $15 per month or $150 per year. Listen to the entire archive of shows spanning nearly twenty years, as well as get access to the Veritas Lounge where you can watch all of John’s videos and listen to lecture and interview series. As well as get special Premium member downloads and discounts. Find out more here! Premium Group Access – 50% off on groups of 2 or more. ($7.50ea. member /month or $75ea. member /year). Share the weekly Steel on Steel program and archives with Premium access, including the Veritas Lounge at a huge discount! Learn more. You can always upgrade your membership at any time, just visit the My Account Page and click the Manage Subscriptions link. Make your selections from the drop down boxes and click Apply Selection. If you want to downgrade, repeat the process, and the remaining credit will be applied toward any future billings. Steel on Steel is supported entirely by our membership and the faithful and generous giving of our members. If you found the information provided useful, please consider a donation above and beyond your subscription. Please note: In order to preserve our freedom of speech, Steel on Steel is not a 501(c)(3) tax exempt organization and therefore, donations are not tax-deductible. Thank you for your support and consideration. We also support Christians suffering persecution around the world, and are in the process of helping a young pastor and his family escape their hostile country. If you are so led, please prayerfully support “PastorX and his family with your tax-deductible donation here. For more information about PastorX and how you can help, contact Candlelight Fellowship at Candlelight.org. Be sure you never miss any of your important membership notifications by adding Steel on Steel to your email contacts. When you receive an email from us, simply click on our profile icon in the head of the email and click “Add to Contacts”. If you aren’t receiving the weekly program email or any subscription notifications, the emails we are sending may be going into your SPAM or trash folder. 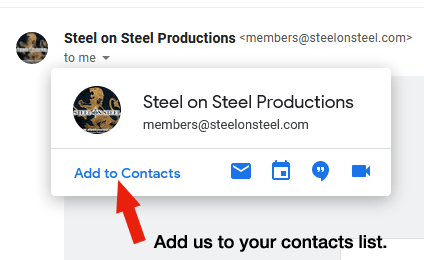 Search for “Steel on Steel” in all your email folders to restore them to your inbox and be sure to add us to your contacts using the method shown. Login and listen to the weekly program right on the Home page or show post page by either playing it directly in your browser, or by downloading the MP3 to your computer for local playback or copy to a portable MP3 player. 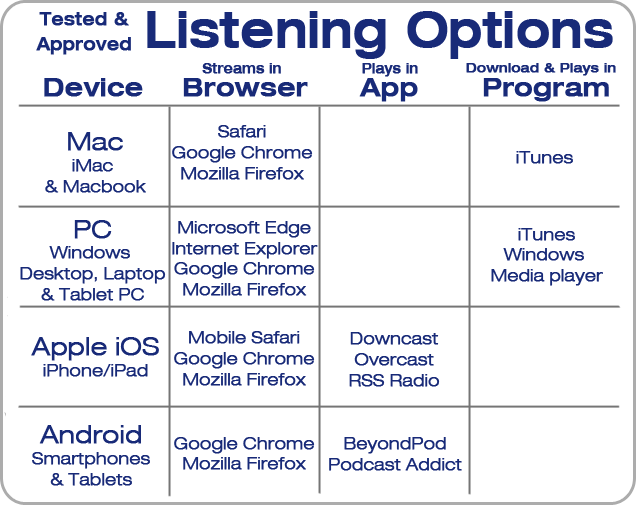 Listening on a mobile device? Get an app to listen to the podcast. Get the weekly episodes pushed to your device automatically. You can even access the podcast across all your devices from one single account. You can also view chapter and episode information and take Steel on Steel wherever you go! On the right side of the Home page you’ll see a sidebar featuring a login field, social media buttons, search bar, archives list, Program Guide, latest products and more! Comment on a particular show by clicking the comments at the top of each post. Share your favorite show posts with friends or follow us on social media in the sidebar. Premium Members have access to the Veritas Lounge, our exclusive content area featuring all of our DVD videos free to watch, plus more audio downloads, digital resources and special discount offers on Media Store items! Not a Premium member? Upgrade today by logging in and clicking the Upgrade to Premium button in your My Account Page. Visit our Media Store where you can purchase Steel on Steel DVDs, CDs, and books. Premium members get a 30% discount (View your Promo code in the Veritas Lounge Page). Show your support for Steel on Steel with SOS branded clothing, mugs, and more! Visit the SOS Gear merchandise store! Check under the Home button for access to various commentary articles and resources like the Lexicon of Johnisms, the Logical Fallacies Reference Guide, or Alinsky’s Rules for Radicals. We also have a Help Page to assist you in resolving any technical issues you may encounter. Have questions, give us a call or drop us an email on our Contact Page. 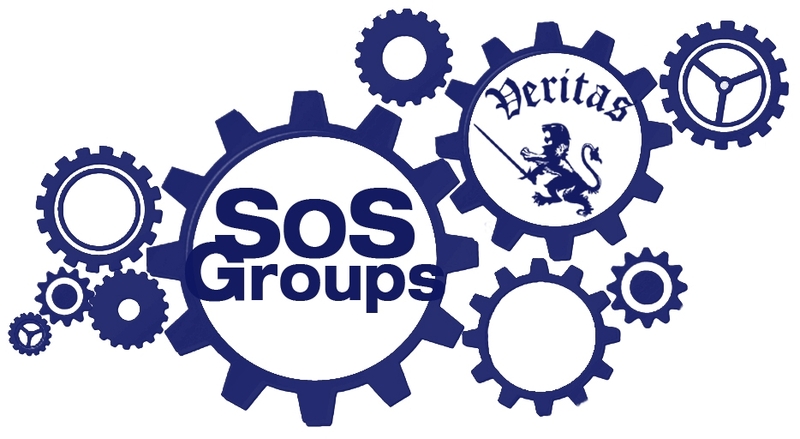 Take your involvement with Steel on Steel up a notch and become an SOS Group Owner. Lean More. Maybe you just want to buy a friend their own Premium membership at half off, or sponsor a larger group at an even bigger discount. Now, sharing the weekly Steel on Steel program and archives with like-minded people has never been easier! Groups of two or more can access Premium-level Steel on Steel content through their own personalized memberships and unique logins. All your group members can access the weekly podcast and nearly 900 archived episodes on their smartphones,tablets, and computers and access the Veritas Lounge for streaming videos and more! You can also just add members manually and share their new login information with them in a nice gift card or email. Whether you just want to pay for a friend’s subscription, or you’re part of a study group or church and want them to benefit, the options and savings are a genuine plus. *Please Note: For your convenience, all subscriptions bill automatically at the end of each subscription cycle. To stop automatic billing, go to Manage Subscriptions in the My Account Page and select No Recurring Billing. We will notify you via email of the changes to your subscription as well as before your subscription expiration. If you’ve selected No Recurring Billing, you will not be charged for a renewal and your subscription will simply expire. You will still have access to login and renew for up to 1 year after expiration without the need to resubscribe. To renew your subscription manually, just login and click the yellow Renew Subscription button in your My Account Page. If you have a promo or discount code and would like to extend your subscription at a discount, visit the Manage Subscriptions link in the My Account Page. Make any desired adjustments to your subscription using the drop down boxes, then enter the promo code and click Extend Subscription. To cancel your subscription immediately, login and click Manage Subscriptions in the My Account Page. Click Cancel Subscription. Your billing will stop and your access to the shows will cease. However, we’ll keep your account profile with your login details and email available for one year in case you want to reactivate your subscription without the hassle of entering all that information. If you do change your mind and want to renew within the one year reservation, simply log into your My Account Page and reactivate your membership in the Manage Subscriptions tab. Once the one year reservation has passed, you’ll need to sign-up again under the original Subscribe page if you want to listen. Please let us know the reason you’re cancelling so we can resolve any issues you may have encountered. We hope you’ll continue to enjoy your subscription for years to come. As always we love hearing from you so feel free to drop us a comment! You can email us at members@steelonsteel.com or call toll free: 1.800.829.5646.